You wouldn’t know it from the weather but we are already one week into fall. Don’t get me wrong I am a huge fan of the warm weather and bright sunshine but I am also a bigger fan of the fall season and all that it encompasses. The bold colors of the fall foliage against the back drop of a grey sky, the drop in temperature that calls for thick scarves and lots of warm layers, the autumn inspired flavoured coffees at the big name coffee houses, apple picking, pumpkin picking, Halloween and of course Thanksgiving, are just a few of my favourite things about this time of year. Thanksgiving is definitely a favourite holiday among my family, whether or not the meaning of the day has been lost on us is a strong possibility but we do know we like preparing mountains and mountains of delicious food and gathering together to eat it until we’re all a little groggy from all the heavy fare. While there is no greater sight to me than piles of turkey, mashed potatoes, brown gravy, egg noodles in turkey broth, and of course the stuffing, with the exception of the occasional green vegetable and cranberry sauce, our table usually lacks in the bright beautiful colors I think of when I think of the fall. I suppose it would be simple enough to make some colourful side dishes maybe some beets or an heirloom tomato salad but really I don’t wait all year round to eat vegetables. The next best way to give our table the festive flare I’m talking about is with a gorgeous center piece. I’ve tried and failed at the Martha Stewart do-it-yourself approach to things like decorations and I leave it to the professionals now. 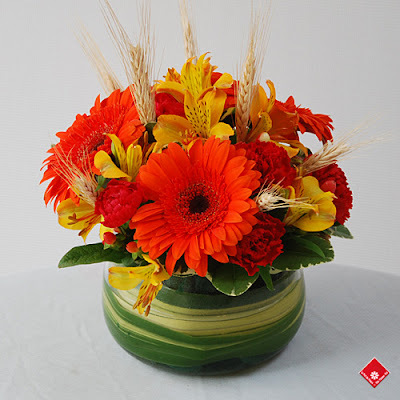 If you want a centerpiece that will make more of a statement than a bowl of mismatched squash and mini pumpkins, check out our ‘Autumn in Montreal’ section on the website for some beautiful fall-inspired ideas. Best of all in honour of my love for the fall theflowerpot.com will be giving away one of our beautifully arranged “Thanksgiving Dinner” arrangements once a week for the entire month of October, valued at $45! You can sign up for our draw today by telling us your favourite thing about fall on our Facebook page and you will automatically be entered into our weekly draw. Best of luck and Happy Fall!